MU interested in action of Ayoze Perez and the Portugal defender – Although January is still less than 2 months away, but the transfer rumors have started aggressively echoing lately. 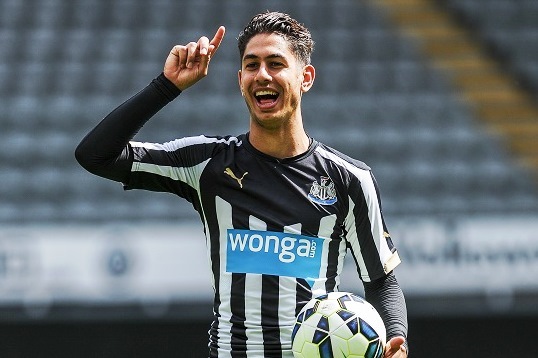 Current rumors mentioned that Manchester United is monitoring the developments of Newcastle striker, Ayoze Perez. The figure of 22-year-old is also wanted by Tottenham, who was noting the attractive debut in this season so far. Perez joined Newcastle from Tenerife at a price of 1.5 million pounds in 2014. He has made one goal in six appearances under Coach Steve McClaren this season. The goal which he had scored was come when he and his team compensate Chelsea 2-2 at St James Park. And Newcastle Chronicle reported that United midst interested in the U21 Spanish players. Meanwhile, the recent Manchester United is also reportedly looking for a new central defender. One of the weak points of the Red Devils this season is in their defense. It's not because they do not have quality players, but United face the injury problems. United coach, Louis van Gaal, even several times had to play Daley Blind as a central defender. That situation makes United's defense is not as solid as it should be. One of the players called incoming radar United is Paulo Oliveira belongs to Sporting Lisbon. The 23-year-old defender was proud that his name is already taken into account by the Red Devils. Oliveira explained to O Jogo that United's interest is a good sign. He did not know whether the report was true or not. But it is very pleasant for him to know that his performance is visible to others. He must continue to work hard and he cannot relax. Manchester United reportedly will soon take off Marcos Rojo. Because of Rojo reportedly did not get along well with Van Gaal this season.